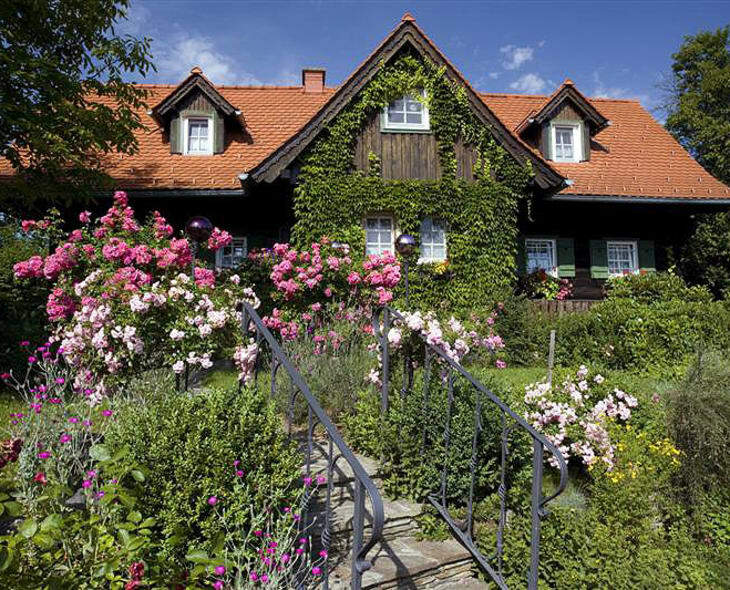 At the Altes Gehöft am Lormanberg, run by the Schöllauf family, the guests can enjoy some time out from the daily grind. The peaceful, idyllic setting, the beautifully furnished huts, and above all, a special welcome gift remain as cherished memories for a long time. The Allerheiligen-Striezel bread has had a long tradition here. In the 19th Century, the so-called ‘pauper’s bread’ would be given to the needy and hungry on All Saint’s Day. In many places, the 1st of November was also known as “Godntag”, when godparents would visit their godchildren, so the universally popular Striezel bread was given as a gift for this special occasion, too. In the Schöllauf family’s kitchen, the beloved Striezel is in season all year round. ‘We had actually never intended to rent out rooms, it just worked out that way over time’, Maria Schöllauf explains. Together with her husband Josef, she renovated her father’s house, soon followed by the adjacent farmhouses. Now there are a few rooms and four houses in the “mini-village” in Kirchberg an der Raab, which are lovingly maintained by the family. Here, visitors can enjoy a wonderful time in the midst of untouched nature, and they are of course given a famous Striezel as a welcome gift. To prepare the braided loaf made from yeast dough, they take flour, salt, yeast, sugar, butter, milk and raisins, and mix them together using a kneading tool. It obtains its unique flavour from lemon zest, which is also made by the passionate baker herself. To do this, she dries the grated lemon peel on top of the tiled oven, which not only fills the bakery with a magnificent fragrance, but also provides an amazing taste..
After resting, the dough is kneaded thoroughly on a wooden board. Grandchildren Matthias and Irina help their grandmother in the Striezel bakery. With impressive speed, they split the dough into two halves, and use them to form six round dough balls, which are then stretched into long rolls. While Matthias effortlessly conjures up two equally large Striezel, Irina shows her dexterity in preparing a children’s Striezel. The art of plating a six-part braid was, of course, taught to them by their grandmother. The shape of the Striezel dates back to antiquity: at that time, widows would cut off their plaited hair to express grief.